Grey plaster walls contrast with tan-coloured window frames at a hillside holiday house in Střekov by Czech architects 3+1 Architekti. The two-storey residence is located on a steeply climbing hillside within the protected landscape of the Czech Central Moutains. Constructed on a tight budget, the walls of the house are made from plaster-covered polystyrene. A single-storey wing projects at an angle from the side of the rectangular residence, providing a children’s playroom. Other popular stories about projects in the Czech Republic include a teahouse with a woven rope dome and a convention centre with a thorny crown roof - see more stories about projects in the Czech Republic here. Photography is by Jan Vaca and Lubomír Fuxa. 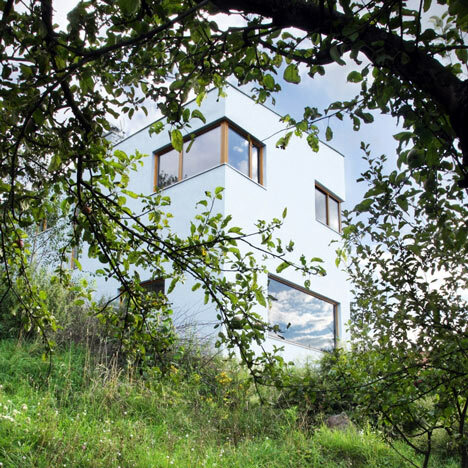 The house was built on a steep plot (elevation about 17m) at the top of Ústí nad Labem district Střekov, on the outskirts where city melts into free landscape. North-south oriented building site with remains of an old orchard is located in the IV. zone of the Protected Landscape Area of the Czech Central Mountains (the Czech name is "Ceske stredohori"). Spare building development in the nearest neighborhood is of a diverse character – terraced houses, prebuilt houses, and cottages of various age, size and quality. Everyday life and needs of the investor, limits of the land, and our strong impression of the location created the basis of our project. By character of the house, used design, materials and project approach, we admit our belief in the importance of individual character of weekend houses and cottages (some good examples are to be found in the vicinity).